For other people with similar names, see Catherine Brown (disambiguation). Katherine Brown (born June 21, 1960) is an American attorney and politician who is the 38th governor of Oregon. A member of the Democratic Party, she previously served in the Oregon House of Representatives, in the Oregon State Senate, and as Oregon Secretary of State. She became governor in February 2015 following the resignation of John Kitzhaber, won the special election the following year, and was reelected in 2018. 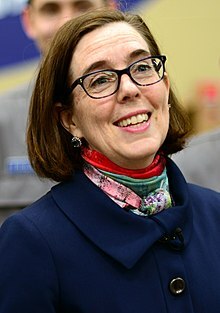 Brown is the first openly bisexual governor in the United States, the first openly LGBT person elected governor in the United States, and the second female governor of Oregon after Barbara Roberts. Brown was born in Torrejón de Ardoz, Community of Madrid, Spain, where her father was serving in the United States Air Force, and grew up in Minnesota. She graduated from Mounds View High School in Arden Hills, Minnesota in 1978. She earned a Bachelor of Arts in Environmental Conservation with a certificate in Women's Studies from the University of Colorado at Boulder in 1981 and a J.D. degree and certificate in Environmental Law from the Northwestern School of Law at Lewis and Clark College in 1985. Brown was appointed to the Oregon House of Representatives in 1991, filling a vacancy left by predecessor Judy Bauman, who took an executive appointment. She was elected to a second term before being elected to the Oregon State Senate in 1996. Two years later, she was elected Senate Democratic Leader; in 2004, senators made her the first woman to serve as Oregon's Senate Majority Leader. 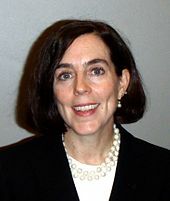 In July 2007, Brown announced that she would give up her seat in the Oregon Senate to be a candidate for Oregon Secretary of State in 2008. On May 20, 2008, Brown won the election for the Democratic nomination for Secretary of State, and on November 5 she won the general election by a 51–46% margin against Republican candidate Rick Dancer. Coming into office, one of Brown’s priorities was to perform rigorous performance audits to help balance the budget. In 2008, for every dollar the State spent, performance audits returned $8 in cost savings. In 2010, Brown reported she delivered $64 in cost savings and efficiencies for every dollar invested in the Division. In 2009, Brown introduced and passed House Bill 2005 to crack down on fraud and abuse in the initiative and referendum system. It gave the Secretary of State more power to prosecute fraud and enforce the constitutional ban on paying per signature on initiatives. Brown also implemented online voter registration. As of March 2010, a year after its introduction, Oregon Public Broadcasting noted nearly 87,000 Oregonians had already registered online to vote. In 2009, the Aspen Institute named Brown as one of 24 "Rising Stars" in American politics and awarded her with a Rodel Fellowship. The program is a two-year fellowship designed to break down partisan barriers and explore the responsibilities of public leadership and good governance. In October 2012, StateTech magazine highlighted Brown's use of iPad and tablet technology to increase accessibility for voters with disabilities. In 2011, Oregon became the first jurisdiction in the country to use this technology to help voters with disabilities mark their ballots. In January 2015, Brown submitted a letter to the Federal Communications Commission (FCC) in support of the purchase of Time Warner Cable by Comcast that had been almost entirely ghostwritten by Comcast, a company that has made a total of over $10,000 in donations to her past election campaigns. On February 13, 2015, Governor John Kitzhaber announced his pending resignation, amid a public corruption scandal; Brown succeeded him on February 18, since the Oregon Constitution identifies the secretary of state as the successor when the governor leaves office prematurely. Brown named Brian Shipley, a lobbyist for Oregon Health & Science University and former deputy chief of staff to Governor Ted Kulongoski, as her chief of staff. As her secretary of state, she appointed Jeanne Atkins. Upon taking office, Brown announced that she would extend the moratorium on executions her predecessor had enacted. She also signed a "motor voter" bill she had championed while secretary of state, to automatically register voters using their driver's license data. In July 2016, Brown signed HB3402, which raised the maximum speed limit to 70 MPH on I-82 and sections of I-84 and US-95. Previously the maximum allowed speed limit allowed on Oregon highways was 65. This bill also raised speed limits on non-interstate highways in eastern Oregon from 55 to 65. Oregon law required a special election in November 2016 for the two years remaining in Kitzhaber's unfinished term as governor. By April 2016, Brown had raised over $800,000 for her campaign in 2016 alone, while her closest Democratic primary competitor, Julian Bell, had raised $33,000. She defeated Bell, Chet Chance, Kevin M. Forsythe, Steve Johnson, and Dave Stauffer for the Democratic nomination. She won the general election against Republican Party nominee Bud Pierce, Independent Party nominee Cliff Thomason, Libertarian Party nominee James Foster, and Constitution Party nominee Aaron Donald Auer, receiving 51% of the vote. In January 2017, she named Nik Blosser as her third chief of staff following the resignation of former chief of staff Kristen Leonard. In June 2017, Brown signed into law the Oregon Equal Pay Act, which sought to reduce the gender pay gap by banning employers from using job seekers' prior salaries in hiring decisions. Brown announced in November 2017 she would run for her first full term as governor the following year. She was reelected in November 2018, defeating Republican Knute Buehler 50.0% to 43.9%, with Independent Party nominee Patrick Starnes, Libertarian Party nominee Nick Chen, Constitution Party nominee Aaron Auer, and Progressive Party nominee Chris Henry taking the remaining votes. In a November 2018 budget plan, Brown proposed a 30-year plan to limit Oregon's greenhouse gas emissions via a "cap-and-trade" system. In 2019, after a measles outbreak in Oregon, she urged parents to vaccinate their kids. "Holy smokes, this is basic science," she said. Brown was integral in rounding up votes to pass a bill in 2003 reforming Oregon's Public Employee Retirement System and then voted against the reform bill in order to preserve her ties to organized labor. Many of her colleagues went on to lose their seats due to backlash from labor unions. As Secretary of State, Brown faced further political backlash when she said she had made a mistake in the scheduling of the election for Labor Commissioner between Democrat Brad Avakian and Republican Bruce Starr. An early election would have favored Starr, but as the election approached, Brown changed her mind and scheduled the election for November, helping Avakian win the race. Brown has been criticized for ousting a number of high-level public officials. She has been accused of mismanaging Oregon DHS Child Welfare in audits published in January 2018. Brown faced an investigation into brokering an agreement – for campaign contributions – between Nike and unions that withdrew a corporate transparency initiative from the general election ballot in 2018. Nike founder Phil Knight contributed over $1 million to the campaign of her Republican opponent. Brown lives in Mahonia Hall with her husband, Dan Little. She has two stepchildren, Dylan and Jessie. She is bisexual and is the country's first openly bisexual statewide officeholder and first openly bisexual governor. ^ "Kate Brown Sworn In as Oregon Governor, Replacing John Kitzhaber". The New York Times. February 18, 2015. Retrieved February 18, 2015. ^ "Kate Brown Becomes Governor". The Oregonian. February 18, 2015. Retrieved February 18, 2015. ^ a b "Gov. John Kitzhaber Announces His Resignation". Willamette Week. February 13, 2015. Retrieved February 13, 2015. ^ "Meet America's First Openly Bisexual Governor". MSN. Retrieved February 16, 2015. ^ Helena Horton (September 9, 2016). "People are celebrating women who made history on US Election night in response to Donald Trump win". The Daily Telegraph. London, UK. Retrieved November 15, 2016. ^ Tim Fought and Jeff Barnard, Associated Press (February 14, 2015). "Scandal makes ex-Minnesotan next governor of Oregon". Star Tribune. Archived from the original on February 18, 2015. Retrieved February 18, 2015. ^ Peter Wong (February 18, 2015). "Calling Kate Brown". Portland Tribune. Retrieved February 18, 2015. ^ Schwarz, Hunter (February 13, 2015). "This woman will soon become the first openly bisexual governor in American history". The Washington Post. Retrieved February 13, 2015. ^ Kost, Ryan (July 10, 2007). "Senator joins secretary of state race". The Oregonian. Retrieved July 11, 2007. ^ a b Bajko, Matthew S. (November 22, 2007). "Political Notebook: Bisexual, lesbian politicians stump in SF". Bay Area Reporter. Retrieved May 15, 2008. ^ Kost, Ryan. "Says for every dollar the state spent on audits last year, it delivered $64 in cost savings". PolitiFact. Retrieved March 19, 2013. ^ "Enrolled – House Bill 2005". 75th OREGON LEGISLATIVE ASSEMBLY—2009 Regular Session. State of Oregon. June 15, 2009. Retrieved February 19, 2014. ^ Foden-Vencil, Kristian. "Online Voter Registration Celebrates First Anniversary". Oregon Public Broadcasting. Retrieved March 19, 2013. ^ "Selects 24 'Rising Stars' in Governance For Its Rodel Fellowships in Public Leadership Program". The Aspen Institute. July 29, 2009. Retrieved March 19, 2012. ^ Wong, Wylie. "How iPads Are Making Voting More Accessible in Oregon". StateTech Magazine. Retrieved October 10, 2012. ^ Woodman, Spencer. "Exclusive: politicians are supporting Comcast's TWC merger with letters ghostwritten by Comcast". The Verge. Retrieved January 26, 2015. ^ "Kate Brown chooses next Chief of Staff". KGW.com. February 16, 2015. Retrieved February 16, 2015. ^ Jaquiss, Nigel (February 16, 2015). "Brian Shipley Will Be Incoming Gov. Kate Brown's Chief of Staff". Willamette Week. Retrieved February 16, 2015. ^ "Jeanne Atkins sworn in as Oregon secretary of state". KATU. March 11, 2015. Retrieved March 11, 2015. ^ Sebens, Shelby (February 20, 2015). "New Oregon Governor Kate Brown to extend death penalty moratorium". Reuters. ^ "Kate Brown gets to sign her own bill, for automatic voter registration in Oregon". OregonLive.com. Retrieved June 20, 2017. ^ "Gov. Kate Brown taps Nik Blosser for new chief of staff". OregonLive.com. Retrieved April 14, 2018. ^ "OCEP EPIC LEGISLATIVE REPORT | Oregon ACEP". oregonacep.org. Retrieved January 23, 2017. ^ Kullgren, Ian (March 9, 2016). "Election 2016: Who's running for office in Oregon? Portland? We've got your list right here". The Oregonian. Retrieved April 7, 2016. ^ Selsky, Andrew (May 7, 2016). "Kate Brown expected to win primary; GOP field mixed". KOIN 6 News. Retrieved May 15, 2016. ^ "Kristen Leonard is Out as Oregon Gov. Kate Brown's Chief of Staff". Willamette Week. Retrieved April 14, 2018. ^ "Gov. Brown's chief of staff resigns | City Region | Eugene, Oregon". projects.registerguard.com. Retrieved April 14, 2018. ^ "Two of Kate Brown's staffers resign following conflict of interest questions". OregonLive.com. Retrieved April 14, 2018. ^ Note, Recent Legislation: Oregon Bans Employers from Asking Job Applicants About Prior Salary, 131 Harv. L. Rev. 1513 (2018). ^ Brown, Kate (November 14, 2017). "Re-elect Kate Brown For Governor of Oregon". Facebook. Retrieved November 15, 2017. ^ Wilson, Reid (December 9, 2018). "New governors plan aggressive climate steps". The Hill. Retrieved December 9, 2018. ^ Staff, O. P. B. "Oregon Governor On Measles Outbreak: 'Get Your Children Vaccinated ... Holy Smokes'". www.opb.org. Retrieved February 14, 2019. ^ a b Jaquiss, Nigel (February 10, 2015). "Governor in Waiting". Willamette Week. Retrieved February 3, 2016. ^ "Kate Brown ousts respected Oregon state librarian". OregonLive.com. Retrieved April 14, 2018. ^ "Oregon DHS child welfare audit says staff endured 'bullying, intimidation' by agency leaders". Statesman Journal. Retrieved April 14, 2018. ^ Manning, Rob. "Audit Finds Wealth Of Problems With Oregon's Child Welfare Office". www.opb.org. Retrieved April 14, 2018. ^ "Child welfare audit is much more than 'just politics': Editorial". OregonLive.com. Retrieved April 14, 2018. ^ "Audit faults top administrators for Oregon's chronic child welfare failures". OregonLive.com. Retrieved April 14, 2018. ^ Dake, Lauren. "Advocacy Group Alleges Oregon's Foster Care System 'Revictimizes Children'". www.opb.org. Retrieved April 19, 2019. ^ "Lawsuit: Oregon DHS failed to prevent abuse in foster care system". Statesman Journal. Retrieved April 19, 2019. ^ Press, Associated. "Oregon child welfare agency under fire". The Lewiston Tribune. Retrieved April 19, 2019. ^ Borrud, Hillary (August 8, 2018). "Oregon DOJ declines to investigate Kate Brown's deal with Nike, unions". OregonLive.com. Retrieved August 8, 2018. ^ Borrud, Hillary (September 7, 2018). "Phil Knight's contributions to Knute Buehler now reportedly total $1.5 million". OregonLive.com. Retrieved September 7, 2018. ^ Walsh, Edward (November 5, 2008). "Democrats sweep to capture statewide jobs". The Oregonian. Retrieved November 5, 2008. ^ "Walking Bi". Portland Mercury. Retrieved February 14, 2015. ^ "Kate Brown, Oregon, 1992". Out and Elected in the USA – The First 30 Years: 1974–2004. Out History. Retrieved February 17, 2015. ^ "November 8, 2016, General Election Abstract of Votes" (PDF). Oregon Secretary of State. Retrieved January 3, 2017. 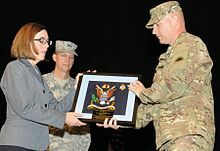 ^ a b c "Kate Brown honored by Oregon State Bar". The Oregonian. ^ "SOPride | Grand Marshal Page". www.sopride.org. Retrieved November 3, 2016. ^ O'Hara, Mary Emily (June 23, 2017). "#Pride30: Oregon's Kate Brown Embraces Status as First LGBTQ Elected Governor". NBC News. Retrieved July 10, 2017. Brad Schmidt, "Kate Brown: Next Oregon Governor Described as Tenacious, Personable," The Oregonian, February 13, 2015. Wikimedia Commons has media related to Kate Brown.